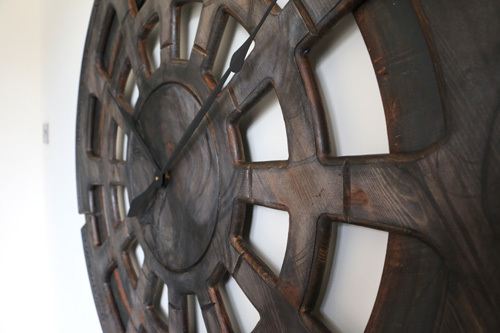 The “Dark Horse” is an extra large clock that we handmade from two large panels of pine wood. 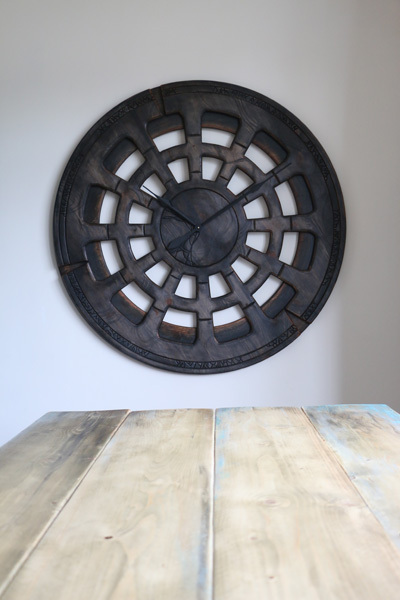 The clock face with its distinct character and features looks amazing on a hand painted and carved background. 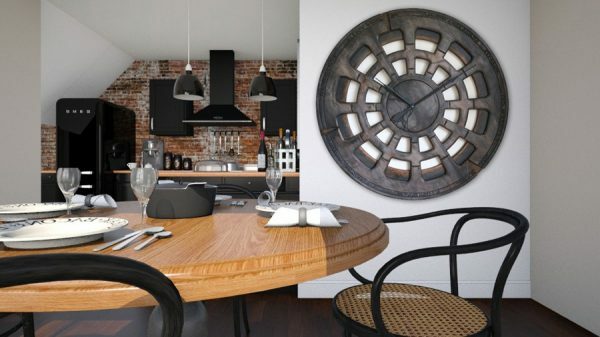 With a total diameter of 48″ the “Dark Horse” will be the centrepiece of attention in your stylish environment. Although original design was 48″ we can now also offer two smaller sizes: 40″ or 30″. Please select the required diameter from the drop down list. 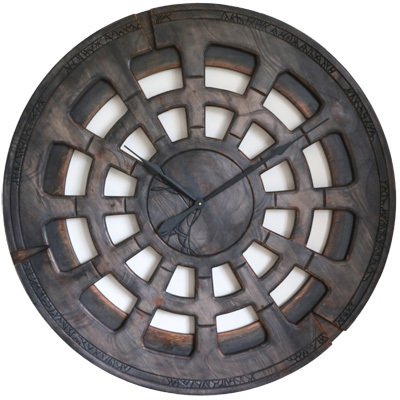 The “Dark Horse” is an extra large clock that we initially designed as another giant wall clock from our collection – “Old Clipper”. Both of those amazing timepieces have similar shape of the face and breathtaking “wow” factor. Unlike the “Old Clipper” however, the beautiful “Dark Horse” doesn’t have full background. It just has a narrow wooden rim that provides stunning three dimensional look and lighter feel. 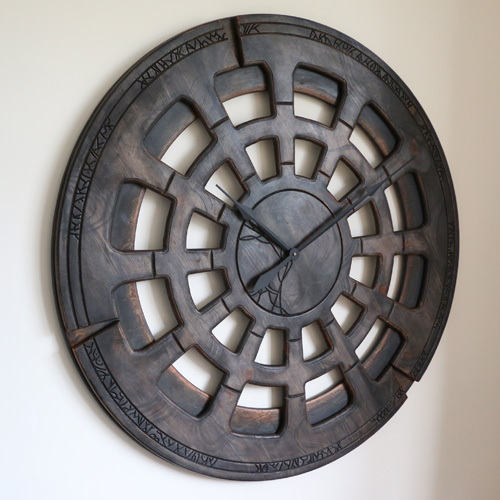 The 48″ face is in dark tones and uniquely shaped with some custom hand carved features. It looks very mysterious and intriguing and will provide a great topic for many conversations around the table. 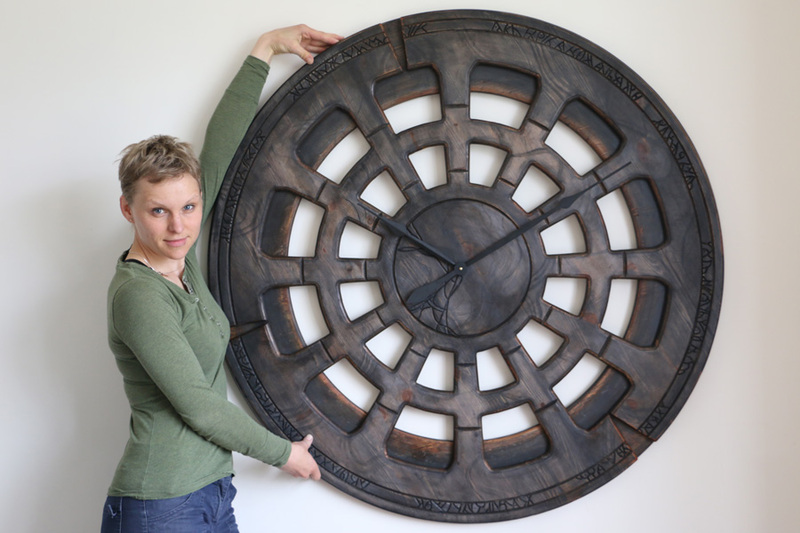 Please look at this short video where I am presenting this fabulous extra large clock. If you like the design but prefer a smaller timepiece we can offer two other options. Simply select the clock diameter from the drop down menu. The clock mechanism is the most powerful battery operated Quartz sweep movement powered up by a single C Cell. We never send it with the hands attached to prevent any damage in transit. When you receive the clock we encourage you to watch this short video where I am demonstrating how you should attach the hands and adjust the time. All Peak Art wall clocks are handmade & hand painted and will certainly come to your mind when you start redecorating your house or building the new extension. You can mount those clocks in any room at your home as long as its not exposed to direct heat or moisture sources. Unlike factory made counter parts, our timepieces have truly imposing look. This is why selecting one of our products for statement wall decoration is a great choice. 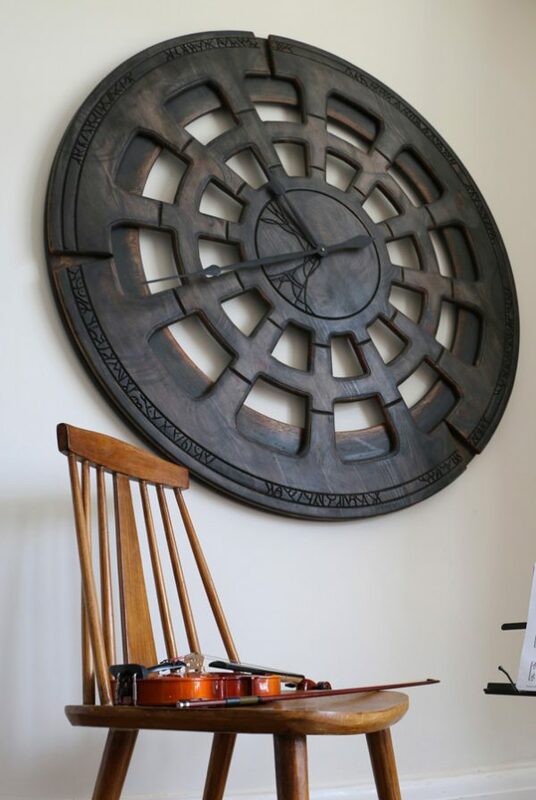 While most people may think that you need large painting or mirror, we are demonstrating that massive clocks aren’t just the time telling devices. If are really looking for something different we encourage you to join Peak Art Facebook Community. Thousands of people are following us, posting comments and suggestions and we would like you to be one of them.